Lumen vs Foot-Candles – Which Is More Accurate for Measuring Illumination? Lumens are defined as a measure of the total amount of light emitted from a source. Foot-candles are the measured amount of light falling on a specific point or object. So while both measurements are relevant, they are definitely not the same thing. As LED lights have become more common, many users are convinced that a high lumen output is most important factor when choosing a light. An explosion proof LED light may produce 10,000 lumens, but that does not take into account the beam spread or the distance it is mounted from the desired target point. An LED light might produce a tremendous amount of light, but if the beam is quite narrow, it will not illuminate a large area surrounding the beam. Measuring foot-candles involves the determining size of the area to be illuminated, the height and angle the light will be mounted at, and how much light each fixture will produce. It is a more detailed process, but provides a more accurate assessment. For example, it might be written – “To achieve 40 foot-candles, you will need 6 fixtures mounted at a height of 20 feet.” Certain types of fixtures, such as high-bay lights, are designed to produce more foot-candles at greater heights than a standard fixture will. 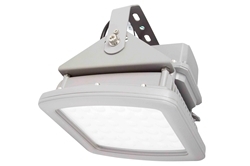 Whereas hazardous area low bay fixtures are designed for lower mounting heights, and generally have lower lumen output since they are close to the ground. Do not hesitate to ask your lighting supplier to help you determine how many foot-candles you will need for an application. Lighting designers will use different tools to determine the amount of light that a fixture or fixtures will provide. The first option is a light meter. The meter measures the level of visible light or illumination. The illumination is stated as foot candles or LUX. The accuracy and of measurement of light meters vary widely. For example, most meters for indoor measurements are not accurate enough for outdoor lighting measurements. For indoor readings, place the meter on the horizontal work location. This reading is the task illumination. To calculate the get the average illumination for the room, take readings in a grid pattern, at 30 inches above the floor, and average the grid points. In areas such as warehouse aisles, the vertical illumination is more important than horizontal. To calculate vertical illumination readings, hold the meter vertically at the task surface such as a shelf. The second method used to determine light output is by using lighting design software such as AGi32. AGi32 is a simulation tool used to design lighting projects and calculate the amount of light that will be delivered based on the user-set parameters. The resulting calculations are commonly referred to as layouts. This type of software is capable of calculating the amount of light that will be delivered in any kind of design, interior or exterior, and incorporate surrounding objects, obstructions, and varying shapes like vaulted ceilings or rooms in non-linear shapes. It aids lighting designers and engineers in the evaluation of lighting designs for projects prior to construction. AGi32 can also simulate realistic renderings of how an area will look once the lighting fixtures are installed. It can incorporate a variety of design needs such as numerous rooms and objects in the same project, and it aids in estimating fixture spacing. Using a light meter or design software will provide essentially the same results, but the software can incorporate many different factors into the results. It is also more convenient to determine foot-candles on the software as the user does not have to be at the location to calculate such. The designer can enter the data on a project half-way around the world and accurately calculate the lighting their customer needs for their application. Assessing your lighting needs will take a little time and effort. A number doesn’t tell the whole story, nor will it get you the fixture that is best suited for you. Taking into account the area, the application, any obstructions that may block the light output, and the fixture chosen will reduce the frustration and disappointment that comes with an uninformed purchase. The in-house lighting designers at Larson Electronics are well versed in designing energy efficient layouts for new facilities as well as retrofitting exisiting halogen, high pressure sodium, and metal halide lamps with LED light fixtures. We can provide you with IES files for lighting analyis, or we can provide lighting studies and layouts for the project at hand.